We have always recycled our plastic grocery bags, but when you count how many a family of only 3 uses (counting double bagging for cans, milk, etc) it is ridiculous. I felt guilty every time we went shopping. Then add in trips to Target....uuggghh. I could wrap my house in plastic bags from a month's worth of shopping. So, over the weekend we bought as many 'green' bags as we thought we'd need for a large grocery shopping trip. I ran back to the store twice, yes twice, for things I kept forgetting on my Super Bowl party list. (I know, I know...I wasn't using my SmartShopper organizer obviously.) It felt good walking in with my trusty reusable bag. Oh and SCORE on the fact that our grocery store gives you a discount for each bag every time you use it. Yeah, it's just a small amount, but paying me to go green? Why, that's just too kind of them. It's the least I could do for our planet. I'll be looking for more ways to help become more green. We've already switched a lot of our light bulbs to compact florescents, put in low flow shower heads, replaced 1 of 3 toilets to low flow ones and will be changing out the other two toilets later. Oooooh Oooooh it's a KITCHEN & HOME ONE DAY SALE!! On Monday, February 2, you'll save up to 60% on more than 400 products!! Indie & International Sale - up to 54% off from now until Febru ary 9, 2009 while supplies last. * Amazon Video On Demand: Indie Movie Rentals Starting at 99 Cents . Offer valid through 2/9/09. * Save up to 50% on Academy Award® Winning Movies . Offer valid through 2/23/09. * Save up to 50% on TV DVDs . Offer valid through 2/12/09. * Save up to 50% on Blu-ray discs . Offer valid through 2/15/09. * Blu-rays for everyone: Buy 3 for the price of 2 . Offer valid through 2/9/09. * Pre-order "Lost: The Complete Fifth Season" on DVD or Blu-ray. * Pre-order "High School Musical 3" in our High School Musical Headquarters. Monday: Dinner at my parents. Yaaaay! Friday: Bacon Cheeseburger Meatloaf - I'll be out for a Girl's Night Out, but this dish will be ready for the family. Saturday: Pasta E Fagioli - I found this on Mari's recipe blog and she says it's FABULOUS and I believe her. ;-) I'm making this for a group of people we're having over. I think I should do a giveaway for green bags. What you think? I need to do a menu plan this week...slow cooker chicken taco sounds good! I am green!!! I not only have the bags from various stores...I make them too!!! good idea. I currently have a Shaws reusable bag and another that is pink with the breast cancer ribbon on it, my BF won't carry the pink one.....men. I love me a give-away.....bags or otherwise :) Do it! Do it! Congrats on going green! We are forced to use our own bags here, or pay per bag that we need. I wil lbe packing the French bags in my container when it is time to come back. 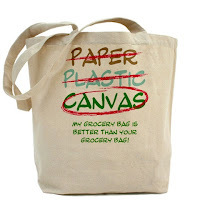 I LOVE the idea of reusable bags, and that your store pays you! Awesome! I love the Slow Cooker Chicken Taco Soup/Chili recipe. It uses ingredients I usually have on hand so I just threw a batch together for dinner tonight. Thanks a bunch! My vote is always yes for a give-away. Everyone loves a prize. Yes! A giveaway for green bags is perfect! They can be used for so much more. They hold sooo much!! I've also thought about making big bags from the plastic grocery bags. You can cut them into strips and knit them together. You can make bigger bags and it reinforces them. FYI: Sorry to hear of about your friend Carrie. She will be in my prayers.